QC Event School offers a variety of event planner classes online in key sectors of the planning industry. Learn professional planning techniques to plan milestone events, corporate product launches, large-scale weddings, and more! Launch your own event planning business or work for a well-established event and wedding planning company. Whatever your career goals, getting started in event planning is simple with an industry-recognized planning certificate. Enter the event planning industry with confidence! Learn about the essential event elements and key considerations to pull off a wide range of events. QC’s most comprehensive and popular course! Learn about all the components necessary to plan a successful event from start to finish. Client care, vendor negotiation, and budgeting are just the tip of the iceberg. Whether it’s a holiday party, a company picnic, or a lakeside wedding, you’ll be prepared for any client who comes your way. Become an in-house corporate event planner or start your own business. Work for tech companies, post-secondary institutions, or non-profit groups to plan events such as product launches, job fairs, and charity galas. Discover the flexibility and travel opportunities this rapidly growing and lucrative sector can offer you. Expand your creative and organizational skills to design an event’s mood and aesthetic experience. Learn to coordinate lighting, color, table décor, and floral design to enhance your clients’ chosen theme and event objective. Clients will pay more for your specialty expertise! Not interested in a wedding planning career? The event planning course is for you! Gain practical knowledge and professional skills in all aspects of the event planning process. Learn to plan a range of different events including milestone parties, retreats, public exhibitions, and charity auctions. Exceed expectations by learning to plan unique weddings tailored to your client’s wishes. Learn about the wedding timeline in detail as well as study civil and cultural variations and building relationships with reception vendors. You will graduate with the tools you need to plan a wedding of any scale. Expand your professional event and wedding planning qualifications. Increase your revenue and land more prestigious clients by marketing advanced services! Pre-requisites: QC’s specialization courses build on previous concepts learned from QC’s foundation wedding and event planning courses or equivalent. Students should complete a foundation certification course or have sufficient industry experience before advancing to a specialized event planning course. Learn how to use your existing event planning skills to succeed in the live events industry. You’ll study topics including concert promotion, show production, sports entertainment production, festival planning, and much more. Discover the logistics of public events and learn how to manage both small- and large-scale festivals and entertainment events. Learn how to plan and coordinate extravagant, upscale events and weddings! Work with large budgets, network with high-end vendors, and incorporate the latest trends. Discover the upgraded activities and services you can offer and how to market your luxury event planning services. Gain practical skills to plan and coordinate gorgeous destination wedding ceremonies on remote islands or at faraway castles. Network with travel agents, translators, and niche vendors to plan once-in-a-lifetime weddings. Finally, expand your marketing strategies and make the most of your online presence. Work one-on-one with an industry expert to grow your event planning business. You will learn how to work with a variety of advanced marketing and project management tools to help you achieve your business goals faster. Your tutor will create customized assignments for you to help your grow your client list and profitability. Enroll in more than one course and receive a 50% discount on all additional courses. Develop and refine your technical skills and theoretical knowledge with these popular course combinations. Find the combination that best suits your career goals and graduate with multiple certifications! Choose from these popular course combinations, or create your own. For the wedding-obsessed planner. Get all the tools to be an expert wedding planner and conquer the local market! Enter the world of corporate and special events. Plan seminars, conferences, tradeshows, and much more! Get all the tools you need to start your own business in event and wedding planning. Set yourself up for success! Become the ultimate event & wedding planning professional! Get all the tools you need to beat out the competition! QC’s online event and wedding planning courses are self-paced and highly flexible. After enrollment, you’ll receive your login details to the Online Student Center while you wait for your physical course materials to arrive in the mail. Contact QC’s Student Support for assistance throughout your online event courses. QC’s team is available 7 days a week to answer your questions, discuss your learning and career goals, and provide guidance on your assignments. Connect by phone, email, or Live Chat – anytime! Not sure which event planning course is for you? 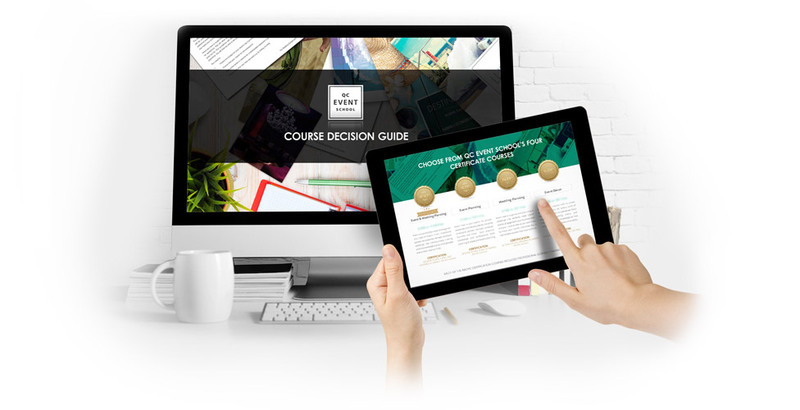 Download the Course Decision Guide to help you choose the event training course that matches your career goals and interests.